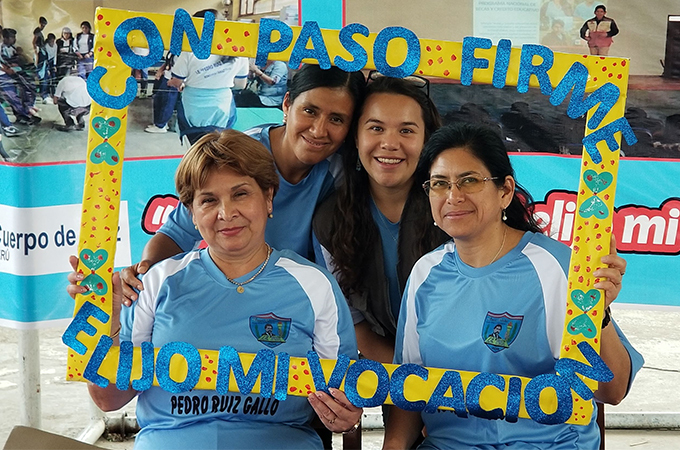 Alejandra Garcia ’16 (back right) is a Peace Corps youth-in-development volunteer in Peru. Peace Corps has announced that the University of Redlands places fourth among small schools on the agency’s list of top volunteer-producing colleges and universities for 2019. With 15 Bulldogs currently volunteering in countries around the world, the University now has received the honor for two years in a row. Since the Peace Corps’ founding in 1961, more than 280 alumni from Redlands have served abroad as volunteers. The Peace Corps ranks its top volunteer-producing colleges and universities annually according to the size of the student body. The Peace Corps website provides the complete 2019 rankings of the top 25 schools in each category as well as an interactive map that shows where alumni from each college and university are serving. Learn more about Community Service Learning at the University of Redlands.